Everyone has a fisherman in the family Mine is my Hubby and Mother in law. The poppy seeds act as a gentle scrubbing agent while the lemon essential will help remove odors from the skin. INCI Ingredient Label: Propylene Glycol, Sorbitol, Water, Sodium Stearate, Sodium Laureth Sulfate, Sodium Myristate,Papaver Orientale (Poppy) Seed, Citrus Medica limonum (Lemon) Peel Oil, Sodium Laurate, Triethanolamine, Olea (Olive) Europaea Fruit Oil, Yellow 5, Green 3. Remove soap from 2 lb. plastic tray. Cut off 1/2 of soap, or 16 oz. Cut soap into small chunks and place in glass measuring cup. Place cup in microwave and heat soap until completely melted. DO NOT BOIL. Remove from oven. Stir soap gently to be sure all soap is melted. Add .5 oz. or 2 Tablespoons of poppy seeds. Gently stir. Seeds are very light and should suspend well in soap. Add .5 oz. or 2 Tablespoons of Lemon Essential Oil. Gently mix into soap. Let soap set for about 5 minutes. As the soap cools, it will thicken and better suspend the seeds. Stir soap gently, then pour evenly into the 3 cavities in soap mold. Let soap set for about 10 minutes, then place in freezer for about 20 minutes until soap has completely hardened. Freezing will help with removing soap from mold. Once set has been removed from freezer, gently press on bottom of soap cavity to release soap from mold. Repeat directions to make remaining 3 soap bars. When soaps are finished, wrap and label accordingly. 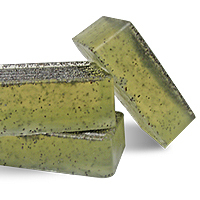 NOTE: Glycerin soaps (MP soap) must be tightly wrapped to keep moisture away from soaps. Inexpensive plastic wrap or shrink wrap bags work well for this purpose.